San Antonio artist Richard Armendariz utilizes traditional painting, drawing and printmaking techniques, while adding the less-traditional element of carving imagery with power tools into the surfaces of his pieces. Cultural, biographical and historical references coupled with dramatic, swirling backgrounds are integral to Armendariz’s art works and reflect his Texas border-region upbringing. Denton artist Matthew Bourbon’s paintings straddle the line between representation and abstraction to examine the dichotomy between private versus public, and what is shown as opposed to what is hidden or obscured. 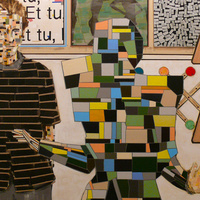 Blurred human figures reduced to blocks, blobs or stripes of color that erase specific identity are painted in familiar settings that provide context for the interactions being played out.